How Do I Calculate Tidal Volume With Ideal Body Weight? Spirometry, the measurement of volumes of air moving into and out of the respiratory system, helps doctors detect and treat respiratory diseases. 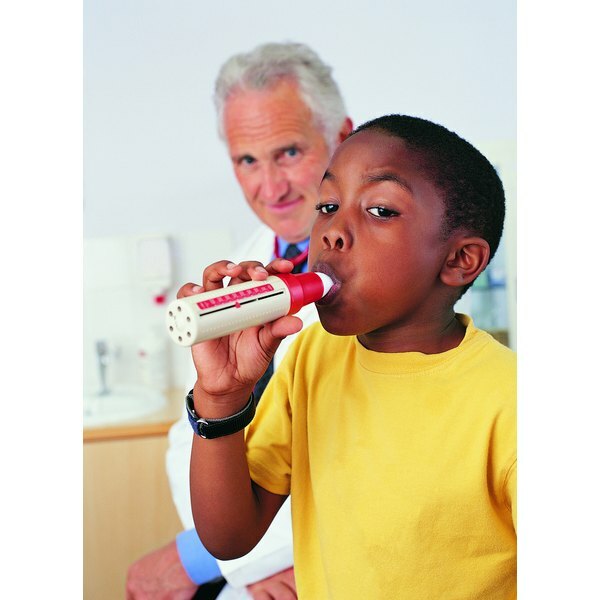 A spirometer contains a mouthpiece attached to a volume indicator or airflow transducer; advanced models produce a graphical spirogram. You can calculate respiratory volumes, capacities (the sum of two or more volumes) and rates using a spirogram or spirometer lab data. Fluctuations in these calculations usually imply respiratory disease. Calculate tidal volume (TV), an indicator of air volume during normal breathing, on a nonrecording (dry) spirometer by finding the mean volume of three normal exhalations. On a spirogram, measure the distance between the crests and troughs of the small waves, then find the mean of these values. In a classroom setting, ask your lab instructor whether you need to correct for differences in body temperature, pressure and saturation (BTPS) and the conditions in the lab environment and, if so, which correction factor to use. Compute expiratory reserve volume (ERV), the maximum volume of air exhaled beyond the exhalation of a normal breath, on a dry spirometer by having the test subject exhale maximally into the mouthpiece after exhaling normally. On a spirogram, find the difference between the trough of the lowest wave and the trough of the closest tidal volume wave and correct for BTPS. Calculate vital capacity (VC), the maximum possible volume of air exhaled and inhaled, on a dry spirometer by having the subject inhale the maximum amount of air, then exhale as forcibly as possible into the mouthpiece. On a spirogram, calculate VC by finding the sum of inspiratory reserve volume (see step 5) plus tidal volume plus expiratory reserve volume (VC = TV + IRV + ERV). Multiply vital capacity by the factor for your subject's age group to obtain residual volume (RV), or the volume of air remaining in the lungs after maximal exhalation (RV = VC x factor). Obtain inspiratory reserve volume (IRV), the maximum possible amount of air inhaled beyond the inhalation of a normal breath, on a dry spirometer by finding the sum of the tidal volume and expiratory reserve volume and subtracting this value from the vital capacity (IRV = VC - (TV + ERV)). On a spirogram, measure the distance between the crest of the tallest wave and the crest of the preceding tidal volume wave and correct for BTPS, then calculate vital capacity (go back to step 3). Find the sum of the tidal volume plus inspiratory reserve volume to obtain inspiratory capacity (IC), the maximum possible amount of air inspired above a normal exhalation. On a spirogram, subtract the value for the expiratory trough immediately before the maximal inspiratory peak from the inspiratory peak value and correct for BTPS (IC = TV + IRV). Add the expiratory reserve volume plus the residual volume to get functional residual capacity (FRC), a measure of how much air remains in the lungs after a normal exhalation (FRC = ERV + RV). Find the total lung capacity (TLC), or the total volume of air that the respiratory system holds, by adding the inspiratory and expiratory reserve volumes plus tidal volume and residual volume (TLC = IRV + ERV + TV + RV). Measure the amount of air expired during the first second of the forced expiratory vital capacity test, when the test subject inspired and expired maximally as rapidly as possible. This gives you forced expiratory vital capacity (FVC), which indicates pulmonary health. Multiply the tidal volume times the respiratory rate, or the number of breaths taken per minute, to get minute respiratory volume (MRV). This represents the total amount of air moved into and out of the respiratory system each minute (MRV = TV x respiratory rate). Female volumes and capacities average 20 percent to 25 percent less than those of adult males. Age, body size, physical conditioning and certain diseases, disorders and injuries also affect respiratory volumes and capacities. Do not attempt to diagnose any disease from these calculations. If you suspect a respiratory disease or disorder, consult a doctor immediately. "Anatomy and Physiology, 9th ed. "; Rod Seeley, et al. Chloe Broussard has been a biologist and educator since 1999. Her articles have appeared in several publications, including "The Open Marine Biology Journal." She was awarded the University of Texas Endowed Presidential Scholarship in 2002. Broussard holds a Master of Science in biology from Texas A&M University-Corpus Christi.